Although C. S. Lewis (1898-1963) achieved a level of popularity as a fiction writer, literary scholars have tended to view him as a minor figure working in an insignificant genre-science fiction-or have pigeonholed him as a Christian apologist and moralist. 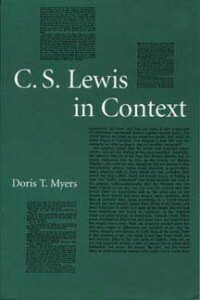 In C. S. Lewis in Context, Doris T. Myers places his work in the literary milieu of his times and the public context of language rather than in the private realm of personal habits or relationships. A central debate early in the 20th century concerned the nature of language: was it primarily objective and empirical, as Charles K. Ogden and Ivor A. Richards argued in The Meaning of Meaning, or essentially metaphorical and impressionistic, the approach of Owen Garfield in Poetic Diction? Lewis espoused the latter theory and integrated it into the purpose and style of his fiction. Myers therefore argues that he was not “out of touch with his time:’ as some critics claim, but a 20th-century literary figure engaged in the issues of his day. New readings of many of Lewis’s best known works reflect this linguistic approach. For example, Myers analyzes The Pilgrim’s Regress (1933) in terms of a distinction between archetypal and individual metaphor to highlight the work’s strengths and weaknesses. Instead of interpreting That Hideous Strength (1945) conventionally as a defense of Christianity, she reformulates the debate as that of language the facilitator of rule versus language the instrument of tyranny. She also draws a new parallel between the Chronicles of Narnia and Spenser’s Faerie Queen, showing that they are modeled on similar heroic ideals and narrative technique. Out of the Silent Planet (1938), Perelandra (1943), and Till We Have Faces (1956) are discussed in a new light as well. By approaching Lewis’s fiction through the linguistic controversies of his day, Myers not only develops a new framework within which to evaluate his works, but also clarifies his literary contributions. This valuable study will appeal to literary and linguistic scholars as well as to general enthusiasts of Lewis’s fiction.